Our first note on source control — it appears that the overwhelming online opinion is that each microservice should have its own repository. It’s a fundamental belief for microservices that no code should be shared across services. Personally, this hurts my architect heart just a little, because the amount of duplicated code for any utilities may be high, as well as the lack of a single, unified domain model does give me a bit of heartburn. I understand the principle — self-containment means self-reliance. For the purposes of this blog post, I am putting all of the code into a single repository; however, each microservice will get its own folder under the root. This is done to allow for me to apply branches to demonstrate progress over time. In a real solution, you would have a distinct repository for each microservice, and perhaps a unified repository that references the others as submodules. While the business object may be made of multiple objects, any child object that we can consider as its own business object would be broken out into its own stack of components. To understand how to build a full product solution based on Docker containers, we’ll need to delve into how containers run inside of the host machine (or virtual machine, as the case may be). Using Docker is typically made up of three phases: container building, container publishing, and container deployment. To build a container, you write a set of instructions that take an existing container image, then apply changes and configuration to it. The official DockerHub repository contains dozens of “official” images as well as thousands of user-defined container images. If one of these images isn’t what you need it to be, you create a custom Dockerfile that appends onto the image with step-by-step additions, such as installing system packages, copying files, or exposing network ports. We will be creating a custom Dockerfile when we make our microservices, but for now, we will utilize a standard image to stand up a MongoDB instance. When you start a container, it has a private network. For outside network communications, ports from the container host get forwarded to individual container instance ports. The specific container ports that are open are dictated by the Dockerfile, and the forwarding occurs in one of two ways: you can explicitly map ports from the host machine to the container, or if not explicitly mapped, the Docker container server maps the declared container port to an available ephemeral port (typically ranging from 32768 to 61000). While we could explicitly manage port mappings for the entire solution, it is typically a much better idea to let Docker handle it, and expose port information to containers via its linking mechanism, which we will cover in more detail when we build our first microservice container. These should be set for you (you may beed to restart your terminal/command prompt if it was open during the installation process). These are necessary because the Docker machine isn’t running directly on my laptop, but instead in a virtual machine running on my laptop. The Docker client will effectively “proxy” Docker commands from my laptop to the virtual machine. Before we fire up the container, let’s go over a handful of Docker commands that are very helpful. It’s always good to know the command line stuff before leveraging any GUI anyway. This command will list all running containers, showing information on them including their ID, name, base image name, and port forwarding. This command is used to define a container — it processes the Dockerfile and creates a new container definition. We’ll use this to define our microservice containers. This command pulls the container image from the remote repository and stores the definition locally. This command starts a container based on a local or remote (e.g. DockerHub) container definition. We’ll go into this one quite a bit. This command publishes a built container definition to a repository, typically DockerHub. This command will show the current load on each container specified – it will show CPU%, memory usage, and network traffic. This command shows the latest output from the container. The -f option “follows” the output, much like a console “tail-f” command would. This command dumps all of the configuration information on the container in JSON format. This command shows all of the port forwarding between the container host and the container. Once we understand this reference material, we can move onto standing up a Mongo container. DockerHub image definitions take the form of [owner]/[image name][:tag]. If no owner is specified, “official” DockerHub instances are used — this is reserved for the owners of Docker to “bless” images from software vendors. If the :tag part at the end is omitted, then it is assumed you want the latest version of the image. 2015-09-02T00:57:30.761+0000 I CONTROL  [initandlisten] ** WARNING: /sys/kernel/mm/transparent_hugepage/enabled is 'always'. 2015-09-02T00:57:30.761+0000 I CONTROL  [initandlisten] ** WARNING: /sys/kernel/mm/transparent_hugepage/defrag is 'always'. This concludes part II. In the third part of the series, we’ll continue this by actually creating a microservice or two, managing changes, and then work on applying CI and production deployment techniques. Can you add Dockerfile and futures to github account or such so people can download it and follow? Use this one to get the latest mongo from server if it’s not found locally, make sure you have internet connection. To add to this – there are ‘official’ Docker images of many popular software packages. 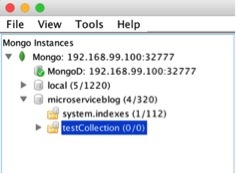 MongoDB’s is simply ‘mongo’ – you know it’s an official image by the lack of an owner name (e.g. owner/image). You do want to check the official Docker repository at hub.docker.com (moving to store.docker.com). Your machine will download the image if it’s not cached locally. Hi Dan, Just want to ask question what is difference between SOA and Micro-service development approach? You might want to consider the micro-services as SOA done in right away on a smaller scale. SOA is more from the enterprise perspective to provide business services, which essentially should have some sort of Message Enhancement and Translation typically achieved by ESB/Service bus. Micro service is more focused and find grained service provided granular or componentized business function. The example shows we have created a container for image “mongo” . Can you share the docker image file from which this “mongo” image is built. Also , in a micro services architecture say , we have a maven project where there are three services and we want these services to run in different containers. So , will we create a docker image file in the project for each service or just 1 image file that will contain description of all services? If , we have 1 image file , then will all the 3 containers be created from the same image file by running the image file 3 times? Very useful for a fresher to get started and going!! I’m having a problem, can you help me?